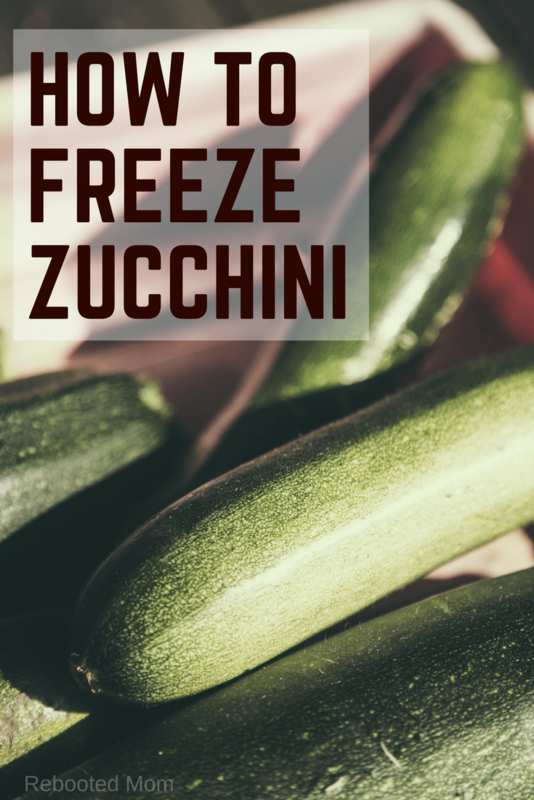 Learning how to freeze zucchini, whether chopped, shredded or cubed, is a wonderful way to preserve a bumper crop of this wonderful vegetable. Anyone that gardens knows that every year there is going to be an abundance of zucchini – if you have ever planted more than 1-2 of these plants you will, at some point, be swimming in the vegetable. Chances are that friends and family might even too. Or, you may find many coworkers bringing them into work just trying to get someone (anyone) to take the bumper crop off their hands. While you might want to resist for fear that you can’t use it all, please, take them all. I repeat: always take them all. Though a lot of zucchini may seem overwhelming to you, it really is pretty simple to use an abundance of it quite fast. Zucchini can be used to make the most wonderful spiced pickles, used in zucchini relish, or even zucchini bread/muffins. The best time to pick zucchini is early on before it starts to develop seeds – you can freeze it by shredding or, free in chunks. I prefer to freeze in shredded form because I use it more often in breads and muffins. However… if you like to enjoy zucchini in soups or stews, you can cut into chunks and freeze that way, too. If you prefer to freeze zucchini by shredding, start by cutting off the ends. Then slice the zucchini into larger chunks that’ll fit in your food processor. If you are without a food processor you can always use a cheese grater. But really, who wants to do more work? Pulse in your food processor until it’s shredded, then pack into pint or quart size freezer bags. Then, squeeze out as much air as possible. I prefer pint size bags that hold 1-2 cups because that works better for recipes than larger quantities. Make sure you label the zucchini with the date and contents. That will help you remember how long it has been in the freezer. When you need to use, just pull out the baggie with the oldest date. Aside from shredded zucchini, cube your zucchini if you plan to use later in soups or stews. Start by cutting into chunks and then blanching. A quick blanch helps the zucchini stay fresher longer, and will slow down the enzymes that are in the zucchini. To blanch: Bring a stockpot to a rolling boil, and put your zucchini in the boiling water. We use a wire basket but you could also use a strainer of some sort, too. Hold in the pot of boiling water for 3 minutes. Then, immediately remove and dump into a pot of ice water for 3 minutes. The key to the cold water is to ensure that you give it a stir or add extra ice as time progresses. This will keep the water as cold as possible, because the hot vegetables will quickly warm the water more than you want. Once the zucchini has been blanched, then drain on dry kitchen towels or paper towels. Transfer to a pint or quart size freezer bag as needed. Once again, I prefer using pint instead of quart but you can do what works best for your family and recipes. Once in bags, freezing may seem rather easy. However, there are a few things that help you have better success in your efforts to keep the zucchini as fresh as possible. Once you bag them into pint or quart size bags, squeeze as much of the air out as possible. Lay the bags flat and level, on a large baking sheet in a single layer. Then carefully slide in the freezer. Once frozen, remove the baking sheet, and stack the bags in columns. That ensures each bag receives sufficient air on all sides while freezing, to allow the vegetables time to cool. If you stack them instead of allowing them to freeze individually, then the layers may not receive adequate time to cool and some of the zucchini may spoil. Whew! There you have it – freezing zucchini is really pretty simple! It’s also a wonderful way to preserve your harvest to use all year. 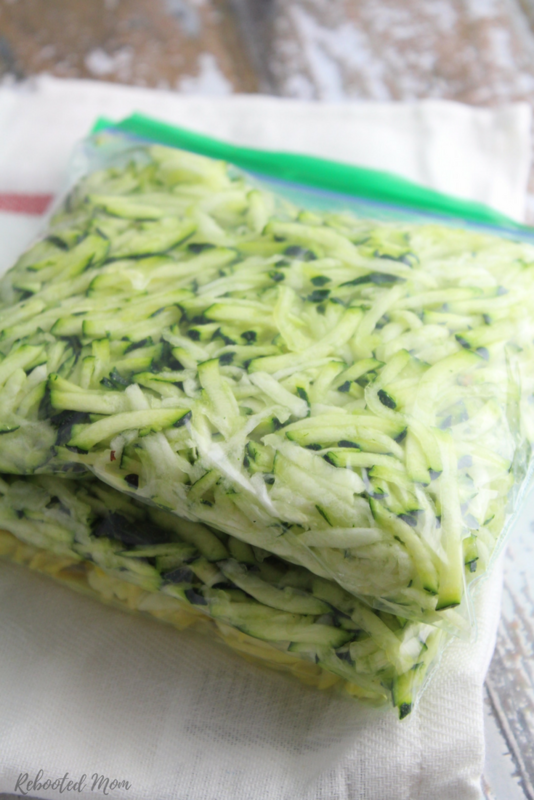 Share the post "How to Freeze Zucchini"